RevContent is the PUP that uses misleading techniques to prevent removal. Use Reimage to locate malicious components and get rid of them faster than with uninstall instructions. A full system scan blocks virus reappearance and prevents traffic to malicious domains. Ads by RevContent can occur on your computer because you have got a PUP infection. RevContent is a PUP which has initiated lots of discussions across the globe, and, most likely, we could find at least one topic related to these advertisements in every computer-related forum. However, you must know that RevContent is NOT a virus. It is a legitimate content recommendation network which has been collaborating with well-known websites such as Forbes, CBS or NBC News. Nevertheless, there might be cases, when various ads might start popping out frequently and intruding computing activity. The service is also known as one of the fastest growing advertising networks, so you should never call it a virus. This article is meant to explain how this ad network works and when these advertisements can become a matter of concern. You can easily encounter “Sponsored by RevContent” ads while browsing the world wide web. As we said before, they are placed there by this advertising network. If you are one of the PC users who has already noticed ads fby RevContent, you might start thinking that your computer needs to be scanned because these ads might be caused by an ad-supported program. However, in most cases, these ads originate from websites you visit, so the owner of these sites are the only ones to blame here. RevContent - adware which causes annoying pop-ups that manage to overload your desktop. Usually, RevContent platform doesn't serve such annoying advertisements (sites that choose to publish them might display a “Before you go, check out more” window, but nothing as aggressive as adware programs do). Therefore, if you started encountering them already, you might be dealing with an adware program that seeks to generate pay-per-click revenue. If you notice that clicking on pop-up or banner ads takes you to strange-looking websites, stop doing so and scan the system with anti-spyware or anti-malware software. You might want to use Reimage software to remove RevContent ads. 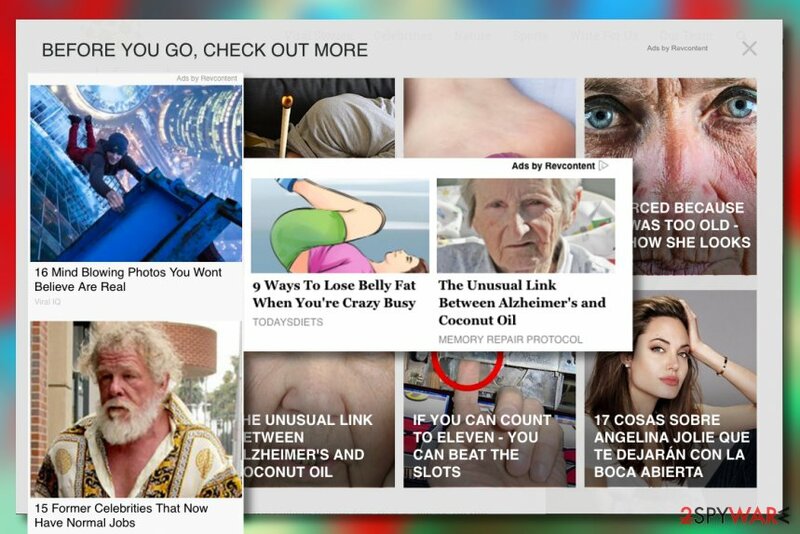 Another thing that concerns computer users is that ads from the described ad network usually look really attractive and enticing. It happens because the advertising platform tends to use tracking cookies to learn more about computer users. These tracking cookies observe your activities and collect the required data, such as your IP address, click data, referral data and more. Such information is used to understand your needs; consequently, you might start receiving targeted ads that match your interests. If you want to avoid such activity, perform the RevContent removal with a trustworthy anti-malware tool. RevContent advertisements appear in a grid on many popular websites online. RevContent ads are unwanted pop-ups which might cause redirects to various pages. If you want to avoid intrusive ads, you should check your computer and remove each of questionable browser add-ons, extensions, plugins and toolbars. Some part of them may seem new to you. Wonder how did they enter your computer? LesVirus.fr claims that these add-ons were likely installed by you in a bundle with freeware and shareware as optional components. You have probably downloaded some other free program that included some attachments. To avoid that, you should be attentive when you install free programs onto your system because they may suggest you installing several additional apps in a bundle with them. Moreover, aim for Advanced or Custom installation settings. These settings allow to review and deny offers to install the 'recommended applications,' while Default and Standard installation settings hide these statements. You just need to find these statements and deselect them – it is as easy as that. RevContent - adware which infiltrates the system thru other applications provided by third-parties. Question: I see suspicious ads almost on every website I visit. I wanted to find out how to block RevContent, which seems to be the provider of those ads. I have seen similar lines on ads that were generated by adware I recently removed. Answer: Dear visitor, we can assure you that RevContent ads are not generated by adware, although it might seem that they are. These ads can only appear on websites that choose to place them for a revenue-generating purpose. 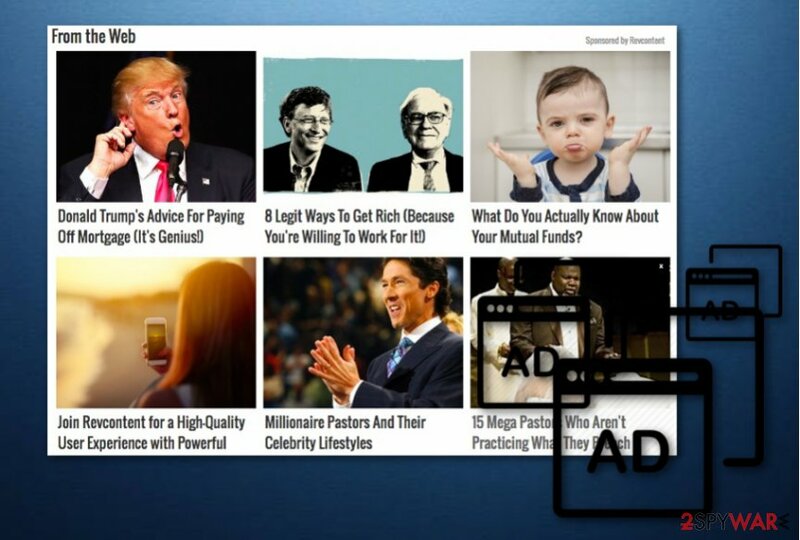 You can even come across these ads when visiting trustworthy and well-known sites such as Forbes. 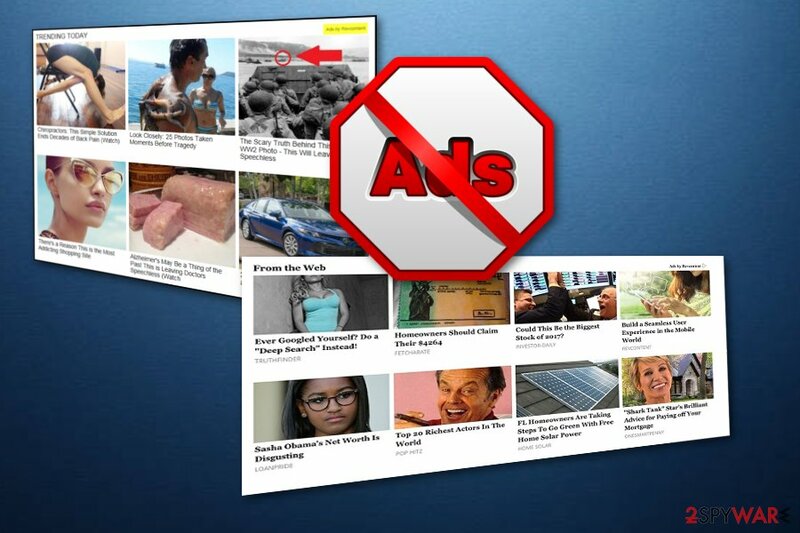 We recommend you to ignore these ads if you do not like seeing them. Question: I think my computer was infected with RevContent adware. I do not like the ads it injects into websites I visit – is there a way to get rid of them? I'd really like to know how to remove RevContent. Thanks. Answer: While RevContent ads seem annoying to some, they are legitimate, and they are not generated by adware programs. You can see these ads on websites that choose to be publishers of the ads. Therefore, there is no way to remove them from these websites. However, if you started seeing suspicious web ads over again and again, all that you may need to do is check your computer for adware-type software and remove it. If after doing so ads by this ad network reappear, you should check one more time. Potentially unwanted programs can be very annoying, so the most reliable way to eliminate them is to delete them automatically. However, some users do not want to use anti-spyware programs – they want to remove RevContent manually. We have provided a list of recommended anti-spyware programs in case you wish to fix your computer automatically. For users who wish to remove PUP manually, we have provided a manual removal guide. It can be found below the article. If you notice RevContent ads only when you browse the Internet, ignore them and continue browsing. However, if you notice that this adware keeps launching new browser windows or tabs and asking for your attention, you might need to remove particular adware from the system. Look through the list of installed programs and delete the ones that might be serving these ads to you. Here, look for RevContent or any other recently installed suspicious programs. Wait until you see Applications folder and look for RevContent or any other suspicious programs on it. Now right click on every of such entries and select Move to Trash. When in the new window, check Delete personal settings and select Reset again to complete RevContent removal. Once these steps are finished, RevContent should be removed from your Microsoft Edge browser. If you are forced to see a lot of pop-ups while browsing the Internet, you might need to check your PC for spyware. Here, select RevContent and other questionable plugins. Click Remove to delete these entries. Now you will see Reset Firefox to its default state message with Reset Firefox button. Click this button for several times and complete RevContent removal. If you notice an increased amount of ads on your computer lately, follow these instructions to remove the adware that sends them to you. Here, select RevContent and other malicious plugins and select trash icon to delete these entries. Click Reset to confirm this action and complete RevContent removal. Here, select Extensions and look for RevContent or other suspicious entries. Click on the Uninstall button to get rid each of them. Now you will see a detailed dialog window filled with reset options. All of those options are usually checked, but you can specify which of them you want to reset. Click the Reset button to complete RevContent removal process. ^ Amit Chowdhry. How Revcontent Grew Into A Content Innovation Powerhouse. Forbes. Global Media Company, Focusing on Business, Investing, Technology, Entrepreneurship, Leadership, and Lifestyle. ^ Vishveshwar Jatain. 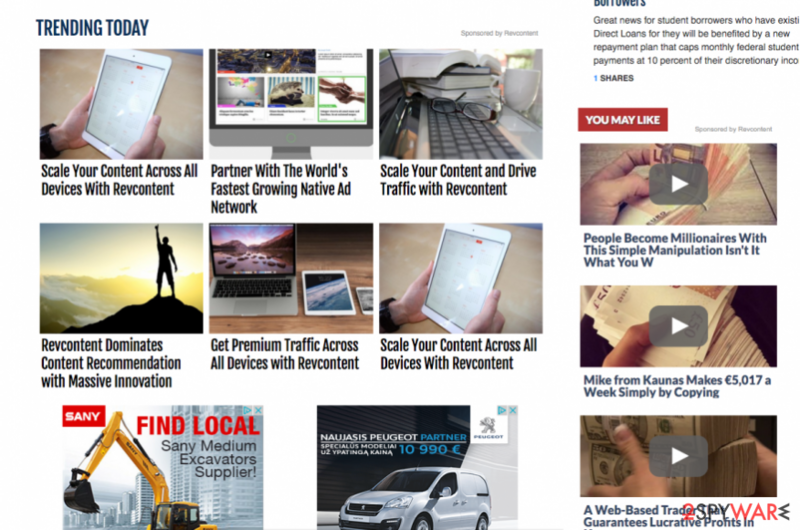 25 Best Ad Networks For Publishers (Updated for 2017). AdPushup Blog. A Growth blog for Blogging and Ad Ops Professionals. ^ nti-Spyware. Techopedia. IT encyclopedia. ^ LesVirus. LesVirus. Malware Removal Guides, Security Tips. This entry was posted on 2019-04-01 at 01:56 and is filed under Adware, Viruses. You can quickly scan the QR code with your mobile device and have RevContent manual removal instructions right in your pocket. How did you remove RevContent?